The last time the Drexel University men’s lacrosse team started a season with a win was in 2007. Non-coincidentally, the Dragons’ first game every season comes against a men’s division I lacrosse powerhouse, the University of Virginia Cavaliers. It starts the season off showing the team some tough competition, getting them primed for a long season of play against good opponents. This season, preseason rankings have the Cavaliers ranked low compared to their typically lofty standards, ranked 13th in the nation. Drexel is currently unranked, coming off a 7-8 season last year, and looking to improve and incorporate their young talent. The season kicked off Feb. 20 at Vidas Field in front of a rowdy home crowd, hoping to break the streak of season opening losses. Three minutes into the game, UVA got on the board courtesy of an unassisted goal of Zed Williams, zipped by goaltender Jimmy Joe Granito. The Dragons wouldn’t let the Cavaliers ride that momentum, though, as they came back with a goal by Cole Shafer, assisted by Michael Kay. 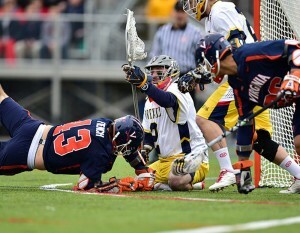 With two minutes remaining in the first, Greg Coholan drilled a second goal for the Cavaliers, and they ended the quarter with a one goal advantage. Shortly into the second period, the Dragons knotted the score at 2-2 with a goal by Robert Frazee. The remainder of the quarter was mostly in UVA’s favor and they headed into half with a 6-4 advantage. The third quarter came and went, and with it went the Dragons’ hopes. The Cavaliers pressured the Dragons’ defense and continually were able to break through, getting six shots on goal and scoring four in the period. The Dragons headed into the final quarter with four goal disadvantage, 10-6. The fourth quarter was more of the same, as the Dragons conceded seven shots on goal and four more goals and were only able to score one of their own and they fell to the 13th-ranked Cavaliers, 14-7. Though the margin of defeat was large, this isn’t a particularly troublesome loss for the Dragons, as it’s only the first game of the season against a strong opponent and could be more appropriately described as them just getting their feet wet in the 2016 season than a real important contest. Some statistics do stand out, however. In faceoffs, the Dragons suffered a 16-9 disadvantage, which is likely due to the loss of midfielder Nick Saputo to graduation. Saputo was an outlandishly great face-off player for the team last season as a senior, and his loss will absolutely be felt throughout the season for the Dragons. Also important to note is that Granito has taken the mantle of starting goalkeeper for the Dragons, and in this game despite allowing 14 goals he also made 17 saves. Last season, Head Coach Brian Voelker was very liberal with goalie substitutions and will likely continue to rotate through a crop of goalies this season, but it is notable that Granito played the entire game while Cal Winkelman and Will Gabrielsen, both seniors, sat on the bench. Granito will have to perform this season to hold the starter spot, as competition is fierce. Going forward, the Dragons face 18th-ranked University at Albany in Albany, New York at 12 p.m.